How To Place An Absentee Bid. If you cannot attend the 2014 Annual Liverpool Beatles Memorabilia Auction and want to place absentee bids on any items then the various methods are listed below. You will be contacted for further details. Fax to 0113 2779750, (or from the USA 0144113 2779750) with your full name and address, contact number and/or email. ALL BIDS MUST BE RECEIVED PRIOR TO 9.00 BST (8.00 UT) ON SATURDAY MORNING. BIDS RECEIVED AFTER THIS MAY NOT BE TAKEN INTO ACCOUNT. We are required to try and obtain the items for you for the best price possible dependant on bids in the room and other absentee bids on the books. All bids must be in UK£ not local currency. You may be asked to secure your absentee bid with credit card details. This does not mean we will take payment via this method. You will be contacted after the auction if you are the winning bidder for payment arrangements, including any shipping costs. The 2014 Liverpool Beatles Memorabilia Auction takes place on 23rd August 2014 at the Paul McCartney Auditorium at The Liverpool Institute for the Performing Arts. 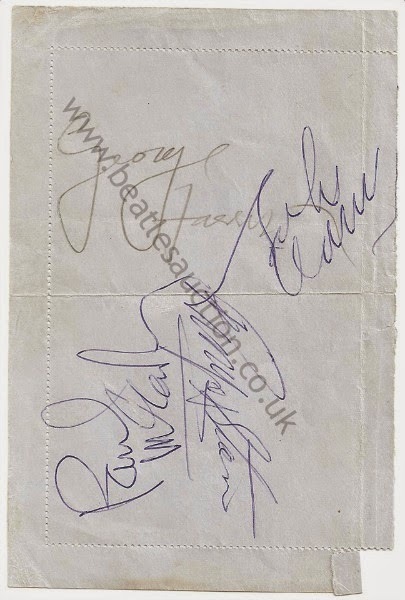 This fabulous set of autographs are going into the 2014 Liverpool Beatles Auction Memorabilia Auction. Item 287 as listed in the Auction Catalogue (a modern Pete Best autograph on a repaired Fan Club night Cavern photocard) has been withdrawn from the sale by the vendor. The pdf file of the Auction items available on this page has been altered to reflect this. However the item was withdrawn after the Auction Catalogues had gone to print. The proper page and all other details will be sorted out and posted shortly but for now here is the full list of items in this year's Annual Liverpool Beatles Memorabilia Auction.